JAKARTA - Five attackers, including two suicide bombers, were killed in Jakarta on Thursday (Jan 14) following a gun and bomb assault claimed by the Islamic State in Iraq and Syria (ISIS) that locked down the city centre for hours and also left two others dead. “A group of soldiers of the caliphate in Indonesia targeted a gathering from the crusader alliance that fights the Islamic State in Jakarta through planting several explosive devices that went off as four of the soldiers attacked with light weapons and explosive belts,” the group said in a statement, Reuters reported. ISIS reported that there were 15 people killed but the official tally according to the Indonesian government is seven. A news agency affiliated to ISIS had also reported the group’s responsibility. Ottawa later said it had been informed by Indonesian officials that a Canadian was among the dead. Earlier, Jakarta police chief Tito Karnavian blamed ISIS for the attack. "ISIS is behind this attack definitely,” he told reporters. He said Indonesian ISIS fighter Bahrun Naim, who is believed to be in Syria, was “planning this for a while". 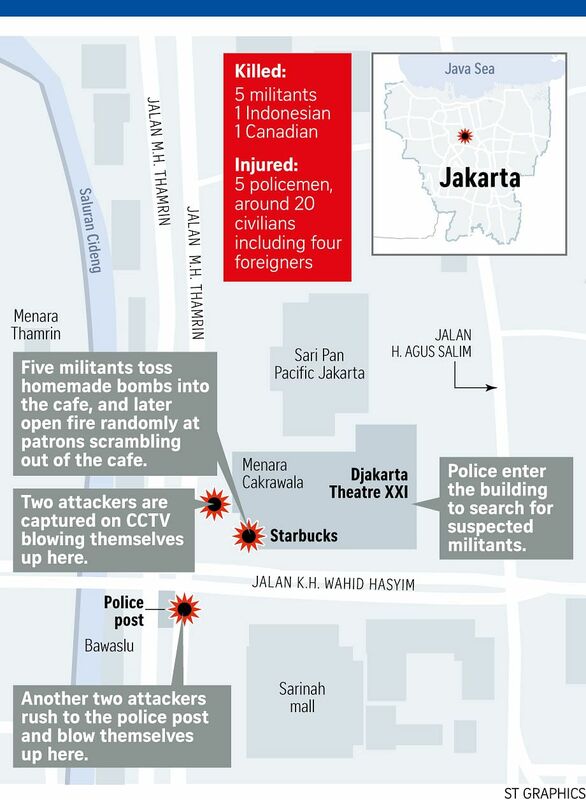 Several blasts were reported in the morning, including outside Starbucks cafe on the ground floor of the Jakarta Theatre building. Another blast occurred at a police post between the building and Sarinah shopping mall which is frequented by foreigners. Two civilians - one Indonesian and one foreigner - were among the seven dead. All five dead militants were Indonesians. Police spokesman Anton Charliyan had earlier told a news conference that a Dutch national was one of two foreigners who were taken hostage at the Starbucks cafe. The other foreigner, identified as an Algerian, managed to struggle free. But Mr Tito later said the foreigner who died was Canadian. Twenty-four people were injured, of them five were from the police. Four foreigners, including a Dutch national who works for the United Nations Environment Programme were among those injured in the blast. The other foreigners are from Austria, Germany and Algeria. In chaotic scenes, security forces moved in behind the cover of moving vehicles, with regular bursts of gunfire and warnings of a sniper in the area. Helicopters circled the area and armoured personel carriers were seen on the streets. A UN building near the scene was locked down with no one allowed in or out, a witness said. Some other buildings in the area were evacuated. Indonesian President Joko Widodo cut short a trip to central Java on Thursday to return to Jakarta. He urged people to remain calm. “Our nation and our people should not be afraid, we will not be defeated by these acts of terror,” he said in comments broadcast by MetroTV. Photos carried by various news sites showed Mr Joko appearing at a crime scene near Sarinah mall in the afternoon, along with officials including Coordinating Minister for Political, Legal, and Security Affairs Luhut Binsar Panjaitan. They left the area after about 10 minutes of inspecting the scene. Condolences poured in from the region in the wake of the attacks. "Shocked and dismayed by news of the bomb attacks in Jakarta today," Singapore Prime Minister Lee Hsien Loong wrote on his Facebook page. "Singapore condemns these attacks. We will give our full support to the Indonesian government to bring the perpetrators to justice," he added. Philippine security forces expressed concern over an “emerging threat” of terrorism, and said there had been no recent specific threats picked up by the authorities in the Philippines. “Our security forces are well aware of the emerging threat and have been conducting operations to prevent terror acts anywhere in the country,” said a joint Philippine military and police statement on the Jakarta incident. Australia's Attorney General George Brandis said its government has offered law enforcement and intelligence assistance to Indonesia following the deadly attacks, The Age reported. Starbucks said on Thursday that some 50 outlets in central Jakarta would be closed till further notice. The US Embassy in Jakarta said it will remain closed on Friday as a precaution. Indonesia has the world’s largest Muslim population, the vast majority of whom practise a moderate form of the religion. Police have been largely successful in destroying domestic militant cells since then, but officials have more recently been worrying about a resurgence inspired by groups such as the ISIS and Indonesians who return after fighting with the group. The last major militant attacks in Jakarta were in July 2009, with bombs at the JW Marriott and Ritz-Carlton hotels. If you are willing to speak further to an ST journalist, please include a contact telephone number. You can also tweet to @STcom or WhatsApp your comments and photos to us on +65 8500 6868. Thank you.